Olentangy Berlin’s Maddie Goodman soars toward the hoop for an easy bucket during the first half of Wednesday’s non-league showdown against visiting Horizon Science. 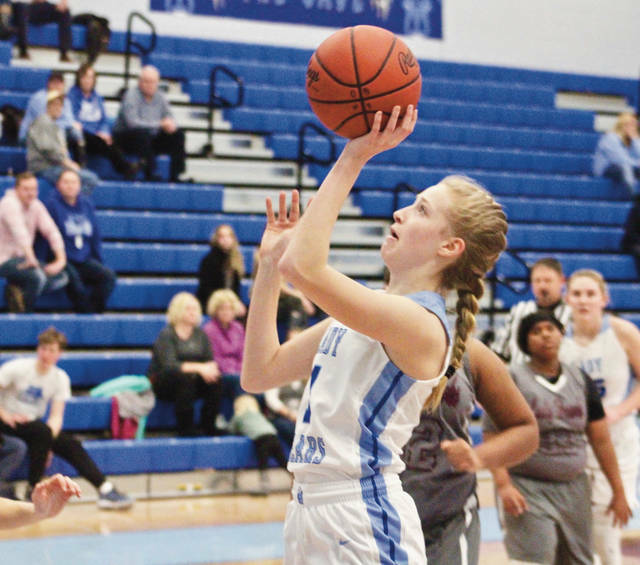 DELAWARE – The Olentangy Berlin girls basketball team started fast with a 30-0 first quarter and never looked back on its way to a 75-16 win over Horizon Science in non-league action Wednesday night. Maddie Goodman and Meghan Boggess scored seven points apiece and Haley Cera, Jessica Nation and Gwynne Kiener added four points each in the Bears’ fast start. Goodman finished with 12 points and Cera and Nation added 10 apiece for Berlin (8-8). Beidelman believes Goodman is a player that can contribute from long range. Tamia Pennyman and Alyssa Ziegler each knocked down 3-pointers for the Hawks, who trailed 42-10 at the break. Ziegler finished with six points to lead HSA (3-11). Berlin came out strong in the third quarter, outscoring the Hawks 19-3 to blow it open. The game also saw four players – Halle Schmidt, Emma Yi, Lexie Syroka and Caelie Bell – get their first varsity points for the Bears, who had 13 different players crack the scoring column. Next up, Berlin returns to OCC-Cardinal play when it hosts Hilliard Bradley Friday night at 7:30 p.m.